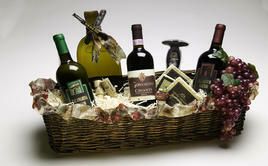 Create a unique, individualized basket for any occasion with Vino 100. Tell us what you're looking for and we can help design one right over the phone! Don't forget to ask about delivery options too. Wine, champagne,stemware, wine accessories, Chocolates, coasters or port, your choice! For a client, employer or employee, make a statement with one of our Corporate Gift Baskets. Branded and customized, our baskets can be priced to fit in any budget. Wooden wine boxes are available for engraving a company logo.